Thousands of children in the United States are challenged with behavioral disorders like Attention Deficit Disorder (ADD), Attention Deficit Hyperactivity Disorder (ADHD) and Conduct disorder. 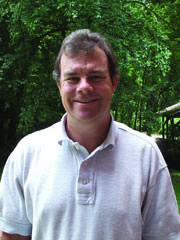 Timothy Vollmer, a professor in the Department of Psychology, studies basic behavioral principles and the application of treatment for both severe and mild behavior disorders in children. “One study involves creating laboratory animal models of common behavioral treatments, while the another involves evaluating parent-child interactions,” Vollmer says. Vollmer works with the Florida Department of Children and Families, where he helps teach foster parents basic parenting skills they can use when interacting with previously abused and neglected children. Vollmer and a group of his graduate students recently joined a state-level task force to address the problem of runaway children in Florida. This extends from previous work with abused and neglected children who Vollmer says are at increased risk of running away, therefore more susceptible to a life of crime, substance abuse and a cycle of further abuse. “The new research is aimed at identifying children at risk of running away and employing pre-emptive interventions,” Vollmer says.